Classic Pasta with Pesto, Thyme for Cooking easy summer side dish. 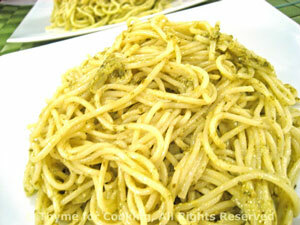 Pasta with pesto is a classic dish from Genoa. If you're lucky enough to have the basil, make it yourself. If not, buy a good commercial brand. Combine pesto and oil in the bottom of pasta bowl. Add pasta and toss to coat. Serve. Add 1/2 cup oil and blend. Add more oil as needed. It really depends on how tightly you packed the basil. I used 1 cup of oil.